Starting November 26 until Christmas, I will have an entry featuring a holiday gift idea, sale, or giveaway! These entries will be posted on Saturdays and Sundays. So check back on the weekends for new steals and deals! 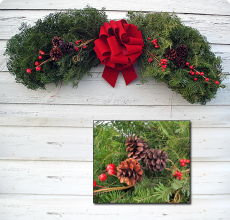 This first entry features Jen's Wreaths in Deer River, Minnesota! They make fresh Christmas wreaths from around October to the end of December. They sent me one last year in exchange for blogging about them, and I was impressed! It came in a nicely packaged box, and it smelled amazing. We hung it in our living room so we could smell it all winter. I don't think we got around to throwing it away until mid-April, and even then it looked and smelled fresh. 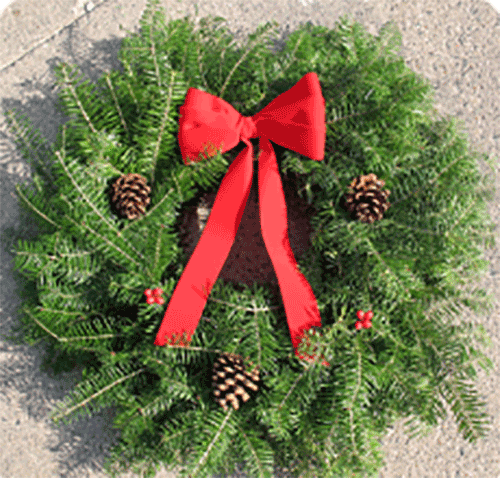 Christmas wreaths, especially Minnesota-made wreaths, are something I've come to love. They're just so fresh and festive. But they don't just make wreaths. They also make door swags, centerpieces, crosses, and candy canes. And I'm not sure if it's new or not this year, but they also sell wreath accessories and ornaments. Another new thing this year is Thanksgiving decor. If you're not quite ready for Christmas, it looks like they still have some harvest wreaths and swags available. 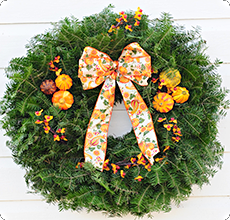 Their fresh wreaths are super affordable, and they are also offering free shipping throughout the holidays. What's not to like? Want to win your own fresh wreath (pictured to the left)? Check out the Rafflecopter form below! 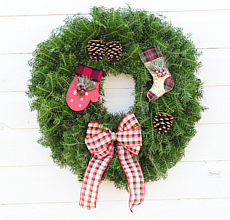 One lucky winner will win an 18-inch traditional wreath, compliments of Jen's Wreaths! Cutting down a Christmas tree. We love going out into the woods and picking out/cutting down our own Christmas tree! I love when my family gets together Christmas Eve we light a bon fire in the backyard and gramma comes out with a tray of hot cocoas and my sister brings out the huge bowl of fresh popped popcorn. With the smell of the burning wood and warm converstations I feel so Merry and Bright! Merry Christmas everyone!! Looking at all the beautiful decorations. After winning your last giveaway you did (THANKS SO MUCH -- BTW)!!! I can't wait to see if I can get similar outcomes in this one!!! Although I may just have to buy one of her wreaths myself! Pulling out the box of Christmas CDs. Except this year I've just been streaming Pandora Christmas music. Baking and decorating cutout cookies! Giving. Who cares about receiving when you can see people's faces when you give them things!